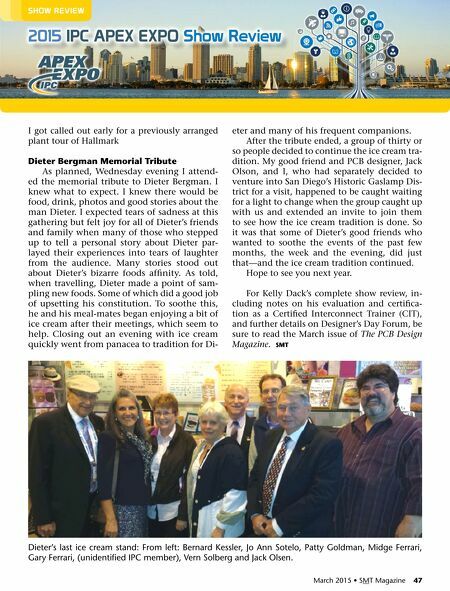 March 2015 • SMT Magazine 47 2015 IPC aPeX eXPo show review show reVIew I got called out early for a previously arranged plant tour of Hallmark Dieter Bergman memorial Tribute As planned, Wednesday evening I attend- ed the memorial tribute to Dieter Bergman. I knew what to expect. I knew there would be food, drink, photos and good stories about the man Dieter. I expected tears of sadness at this gathering but felt joy for all of Dieter's friends and family when many of those who stepped up to tell a personal story about Dieter par - layed their experiences into tears of laughter from the audience. Many stories stood out about Dieter's bizarre foods affinity. As told, when travelling, Dieter made a point of sam- pling new foods. Some of which did a good job of upsetting his constitution. To soothe this, he and his meal-mates began enjoying a bit of ice cream after their meetings, which seem to help. Closing out an evening with ice cream quickly went from panacea to tradition for Di- eter and many of his frequent companions. After the tribute ended, a group of thirty or so people decided to continue the ice cream tra- dition. My good friend and PCB designer, Jack Olson, and I, who had separately decided to venture into San Diego's Historic Gaslamp Dis- trict for a visit, happened to be caught waiting for a light to change when the group caught up with us and extended an invite to join them to see how the ice cream tradition is done. So it was that some of Dieter's good friends who wanted to soothe the events of the past few months, the week and the evening, did just that—and the ice cream tradition continued. Hope to see you next year. 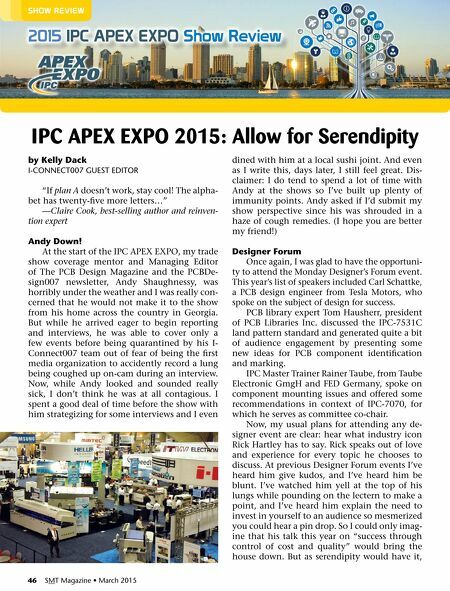 For Kelly Dack's complete show review, in- cluding notes on his evaluation and certifica- tion as a Certified Interconnect Trainer (CIT), and further details on Designer's Day Forum, be sure to read the March issue of The PCB Design Magazine. SmT Dieter's last ice cream stand: From left: Bernard kessler, Jo Ann Sotelo, patty Goldman, Midge Ferrari, Gary Ferrari, (unidentified ipC member), vern Solberg and Jack olsen.